With the release 1.1 of the simulation software, the integrated audio system of Evotek sym 027 can finally express all of its potential. The original physical disposition of the three speakers behind the driver and the woofer “counterposed to the pedals” constitute a peculiar and exclusive characteristic of Sym 027; this disposition permit to address the single audio sources of the motor in a separated physical way. Differently the 027 stereo installation is a professional kind in separated canals; now the unloading of the right cylinders bank and the left one of the motor are actually posted like in the reality, just like the aspirational sound is addressed in the middle of the airscope, while the woofer counterposed to the pedals physically contribute to the transition of the track mutation. The F1 Sym sound is now the most improved and involving audio support present on F1 driving, The sound record of the motor has been exclusively realized by Evotek directly in rehearsal motor room at one of the most prestigious F1 Teams. The audio recording has been made by professionals coming from the, most eminent Italian recording rooms whereas the acquisition standard has been enforced at a level 12 times superior than the standard currently available on market. 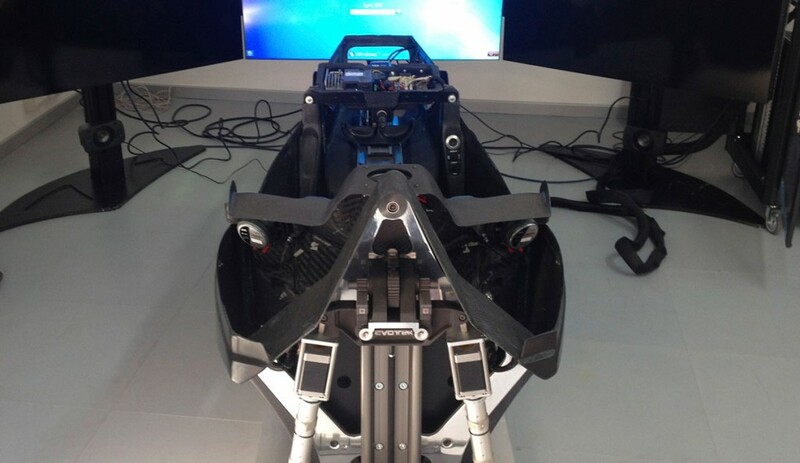 Even in sound Evotek can distinguish and makes the difference and in this occasion Evotek does not distinguish just for F1 timbre high quality sound but also for the physic perception in the cockpit that increase its realism and the immersion into driving but above all it can transmit and create unique emotions. Equipped by default in Club version, is even possible to prepare on 027 on an optional level with two inertial actuators in the pedal zone and in the seatback to increase the vibrational energic contribute. With the development of the touch perception there are basically two advantages: less strain of the visual/cerebral apparat and more rapid reaction times. The system results truly operative in the preventive activation of the attention particularly in the professional area where the practice sessions are more extended and in extreme driving conditions.